WHITE HOUSE PRESS secretary Sean Spicer has apologised for “insensitive” remarks in which he seemed to favourably compare Adolf Hitler’s actions during the Holocaust to atrocities currently being carried out by Bashar al-Assad in Syria. During a White House briefing Spicer yesterday sought to intensify criticism of Assad, painting the Syrian leader’s suspected use of sarin nerve agent against civilians last week as historically evil. “You had someone as despicable as Hitler who didn’t even sink to using chemical weapons,” the spokesman said during a White House press briefing, prompting outraged calls for his resignation. 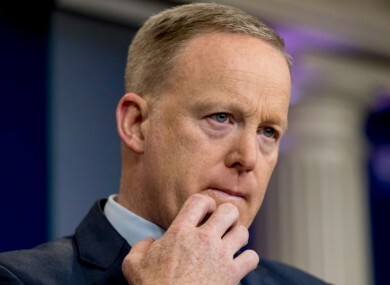 A few hours later, a contrite Spicer appeared on US television expressing regret for the comments, which in the hours after he made them were greeting with growing outrage and demands for his resignation. “Frankly, I mistakenly used an inappropriate and insensitive comment about the Holocaust and there is no comparison,” he told CNN. Spicer’s comments, which came during the Jewish festival of Passover, sparked calls from anti-defamation groups and opposition Democrats for his ouster. “Sean Spicer must be fired, and the President must immediately disavow his spokesman’s statements,” top congressional Democrat Nancy Pelosi said. Spicer — the most public face of the Donald Trump’s administration after the president himself — has been a frequent target of ire and satirists for his angry denunciations of press coverage and sometimes loose grasp of the facts. He was pilloried for his first appearance in the press briefing room in January, when he browbeat journalists and falsely insisted Trump had the biggest inaugural audience ever. He later caused an international incident by claiming British signals intelligence agency GCHQ helped former president Barack Obama spy on Trump. Furious British spies described the claim as “nonsense” and “utterly ridiculous”, forcing Spicer to explain his comments to the British ambassador. But his latest claim brought anger from across the political spectrum and looks of astonishment from the assembled White House press corps, who offered Spicer a chance to clarify. “I think when you come to sarin gas, there was no — he was not using the gas on his own people the same way that Assad is doing,” Spicer said, returning to the subject. In an earlier written clarification, Spicer said he was “in no way … trying to lessen the horrendous nature of the Holocaust”. I was trying to draw a distinction of the tactic of using airplanes to drop chemical weapons on population centers. Any attack on innocent people is reprehensible and inexcusable. Defence Secretary Jim Mattis later offered a hint at what Spicer may have meant, saying that “even in World War II, chemical weapons were not used on battlefields”. Richard Price, professor of political science at the University of British Columbia in Vancouver and author of The Chemical Weapons Taboo told AFP Hitler in fact came very close to using chemical weapons on civilian areas. “Hitler used gas widely in the concentration camps, but they never used them against soldiers nor against cities,” he said. Tuesday’s incident was not the first time this week that Spicer has found himself in rhetorical difficulty over Syria. On Monday, he suggested Trump could take military action if Assad were to drop more barrel bombs — a regular occurrence in Syria’s brutal war and a red line that would almost immediately be breached, making US military action all but certain. The White House privately walked back his comments. Trump’s pared-back approach to staffing has resulted in many of the apparatus around Spicer from being removed. There are around half the number of National Security Council’s communications staff, whose job is — in part — to brief the press secretary on international developments. The State Department does not have a spokesperson and has stopped holding daily briefings, which often serve as an early warning system for the White House about questions and issues headed their way. Email “Spicer apologises over 'insensitive' Hitler remarks amid calls for him to be fired ”. Feedback on “Spicer apologises over 'insensitive' Hitler remarks amid calls for him to be fired ”.